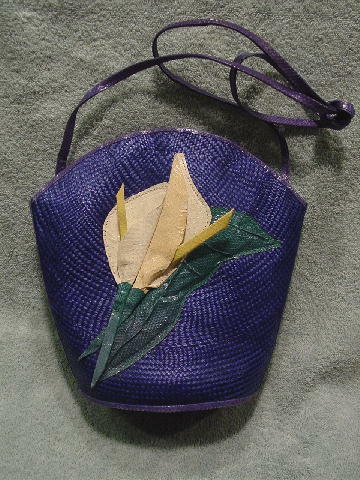 This never-used tightly woven blue straw purse was made in the Philippines. On the front are two calla lily flowers in yellow, antique white, and yellow-cream snakeskin. The leaves and stems are in green snakeskin. All the edges and the 42" long shoulder strap are in a light violet snakeskin. The interior is in a light bone-tan plastic lining with an interior zippered pocket. It's frlom a stylist's inventory.